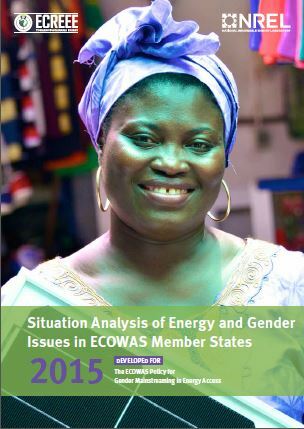 The ECOWAS Centre for Renewable Energy and Energy Efficiency (ECREEE) will be launching its publication on Situation Analysis of Energy and Gender Issues in ECOWAS Member States during the ECOWAS side-event at the United Nations Framework Convention on Climate Change (UNFCCC) twenty-first Session of Conference of Parties (COP), on 2 December 2015, in Paris, France. According to the report, women in the region continue to be outside the decision making sphere and their human rights are often comprised when addressing energy access issues. The study also revealed that although women will be disproportionately more affected by climate change, they possess relatively limited influence on key decisions related to climate change mitigation and adaptation. The report laid the groundwork for the development of the infamous ECOWAS Policy for Gender Mainstreaming in Energy Access, providing insights on how ECOWAS Member States could adopt gender-responsive development strategies to achieve the objectives of the Sustainable Energy for All (SE4ALL) initiative and the Sustainable Development Goals (SDGs). The report was developed in partnership with the United States National Renewable Energy Laboratory (NREL), African Development Bank (AfBD), Austrian Development Cooperation (ADC), Spanish Agency for International Cooperation and Development (AECID), United Nations Industrial Development Organization (UNIDO), ENERGIA and the Sustainable Energy Solutions. The launch of the report on Situation Analysis of Energy and Gender Issues in ECOWAS Member States comes at a time when the UNFCCC is advocating for gender equality as a necessary step to more effectively combating climate change.